EghtesadOnline: The second round of the Tehran Game Convention (TGC 2018) came to a close on July 6 after hosting a diverse range of local and mostly foreign prominent speakers, industry players, promoters and enthusiasts, most of whom could not care less about reimposition of US sanctions against Iran. The run-up to the event, that organizers Iran Computer and Video Games Foundation and Game Connection say was attended by more than 2,500 people, included a series of workshops offered on July 4. The convention was inaugurated early next day. After a working breakfast and a networking gathering at the main hall of IRIB International Conference Center in northern Tehran, Kate Edwards delivered the first keynote speech. The geographer, writer and strategist, who currently helms Geogrify—a consulting firm primarily active in the video game industry—had a few basic pieces of advice for Iranian game developers, according to Financial Tribune. “Location does not restrict game development,” the former Microsoft employee said, adding that talent and ingenuity always prevail. She referred to the Finnish Rovio’s Angry Birds, a game that many wrongly presume was developed in the US due to its popularity, as a clear example indicating that success is not bound to certain geographical limits. She also used the “comparison is the death of joy” quote from Mark Twain to ask Iranian game developers to do their own things and tap into their own millennia-old culture for inspiration that was actually the birthplace of many early games. Legends such as Arash the Archer and Cyrus the Great would make great subjects for Iranian games, she said. TGC’s first-day program next included a “pitch fest” where dozens of Iranian game developers came on stage to introduce their newly-released or to-be-launched games and attract sponsors. Afterwards, two panels convened, one on whether game teams should try to join big companies or accelerators, and another on whether a formal education is helpful in entering the game industry. At the same time, dozens of speeches covering five major categories namely, game design, technology, art, production and business were being delivered to packed halls, while sponsors and developers were already conversing with local and foreign counterparts in booths set up across the hall. The second day also included two panels—on public relations and its influence on the success of computer games and on advertisement campaigns—in the main hall and a host of simultaneous speeches in the aforesaid categories. Many of the speeches focused on how to create successful and profitable games. But the topics were not limited to making money as they ranged from user experience, neuroscience and cognitive science to project architecture, virtual reality, programming, concept arts, 3D, prototyping, workflow, innovation and community management. The speakers at the halls, most of whom were European, were faced with queues of game developers, fervent gaming enthusiasts and occasional fans who were asking follow-up questions about their speeches or inviting them to visit them at their booths and play their games. The majority of the foreign participants had traveled to Iran for the first time having heard of the event through friends and colleagues. The Berlin-based Adjust, a provider of mobile ads attribution and analytics that currently works with a number of Iranian companies as well, was a major sponsor of the event. The company has offices in multiple cities around the world and does business with big American names such as Facebook and Twitter. In spite of US sanctions against Iran, one of Adjust’s representatives told visitors at the company’s TGC booth that it aims to expand operations in Iran as a big market that has been largely left untapped. Kunlun Korea, which specializes in marketing online games and connecting developers, was among the Asian names participating in TGC 2018. 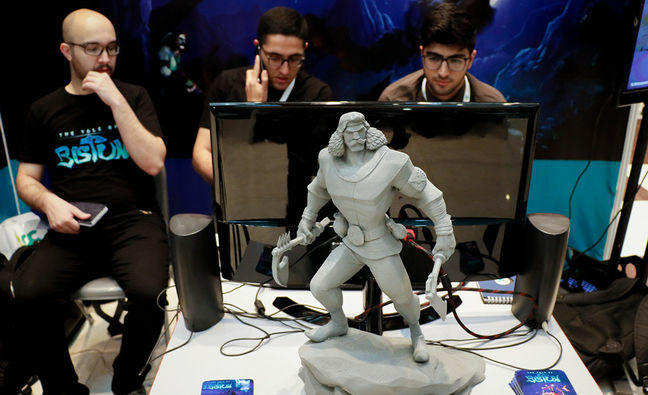 Its chief executive said the company is willing to work with Iranian partners should the opportunity present itself, and looks to connect Iranian game developers to foreign counterparts across Asia. At the end of the event, the Gamistan Awards were handed out for the first time. The awards celebrated games in the mobile and PC categories and were aimed at introducing high-quality products to reputable publishers and distributors. A total of 90 games—including 65 mobile and 25 PC games—from nine countries competed and in conclusion, Pa Pa Land Heads Escape and Filliping Filip were selected as winners in the mobile and PC categories respectively. Gamistan, a blend of “game” and “stan” (a suffix used in Persian and Hindu-European languages for location), is used to refer to a great geographical area consisting of 33 countries from India to Morocco, where more than two billion people live, 40% of whom play video games on a daily basis. Teams of young and creative game developers and players live in this region, making it a highly fast-growing and significant region for the industry.